One of the most impressive alpine meadows located in Uttarakhand, the Bedni Bugyal ranges are the most impressive part of the Himalayan valleys. These are the twin ranges of the meadows of Ali and Bedni that simply lie on the famous routes of the Roopkund Trek. And the famous Bedni Bugyal trekking is all for exploring the deep virgin forests, gurgling brooks, breath-taking campsites, miles of undulating meadows and Mt Trishul and Mt Nanda Ghunti towering over them. Camping at Bedni Bugyal brings the most fascinating impressions of the Garhwal Himalayas at its lap with the most undiluted nature’s wonders. The trek of which starts from Lohajung (8,300 ft), a tiny pass, in the heart of the greater Himalayan range, 85 kms from Karanprayag. From Lohajung, a well marked descending trail through mixed forests will take you to an iron bridge across the Neel Ganga River. Once crossing this river the real trek starts, which is then switched back to Didina- a small village and could be the best camping site for you in the Garhwal ranges; and then the perfect raising towards the twin meadows of Ali and Bedni Bugyal makes a great start. The real adventure in Garhwal Himalayas can best be experienced at the steep switchback climb through the dense oak forests where the brown carpet of leaves marks the trail and once you climb across the trails and dense foliage of greens, the sweet smell of moist earth just lingers around. Camping in Bedni Bugyal will take you finally to a leisurely walk towards Bedni Bugyal, 5 kms away and a mildly descending trail initially. If you are tempted to take off your shoes, allow yourself to do so and feel of the carpet on your toes, just go ahead and do it! In the morning transfer to railway station and from here catch AC train for Haridwar at 06:50 hrs. Arrival at Haridwar by 11:25 hrs. On arrival meet our guide and transfer to Rishikesh by road & check into hotel. In the evening visit the Ganga Ghat for Aarti ceremony at holy river Ganges. Back to hotel for overnight stay. In the morning after breakfast drive to Mundoli (240 km/8-9 hrs) via Devprayag, Rudraprayag and Karnprayag. Arrival at Mundoli by evening. Dinner and overnight stay in tents. In the morning drive 10 kms to Wan, which is the road head for the trek. Today we will trek 11 km (5-6 hrs) to reach Bedni Bugyal, probably one of the best camping sites in the Garhwal Himalayas. Dinner and overnight stay in tents. Bedni Bugyal is a charming green meadow adorned with flowers in a spell binding varieties, in full bloom. 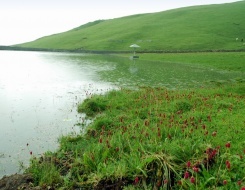 There is a small lake situated in the midst of the meadow, where Tarpans are offered by the devotees. Situated nearby is a small temple where the devotees pay their obeisance, during their halt at Bedni Bugyal. Retrace your steps towards Wan and from here drive to Karnprayag. Dinner and overnight in hotel.. Early in the morning drive to Haridwar and from here catch AC Train for Delhi at 18:05 hrs. Arrival at Delhi by 22:45 hrs Trip and services ends. • Accommodation in a hotel at Rishikesh, Karnprayag on twin sharing basis with breakfast. While on trek Dome/Alpine tents will be provided. • Camping equipment like tents, mattresses, camping stools, kitchen tent, table etc. • Liquor, soft drinks, bottled water, beverages, etc. • Any expenses rising due to bad weather, landslides, etc.